First things first: this is NOT as hard as you think it may be. Second things second: I'm sure there are pre-made patterns for constructing a purse with a frame out there, however you don't need one. You are going to learn how to make one all by yourself! Cool, eh? Third things third: I wrote the instructions with the beginner in mind, but the seasoned sew-person could probably do fine with just skimming through the pics. Purse frames are now available at most big label craft stores for around $6-10, but be sure to bring in your 40% off coupon! The frame I'm using in this tute is one that has little holes along the all the outside edges. The holes are for hand-stitching the frame to your bag. (Don't freak out about the hand stitching! The evenly spaced holes keep all the stitching neat and tidy.) There are other frames without holes that require you to glue and crimp the frame with pliers, but don't buy one of those for this tute. Now, lets get cracking! Freezer paper (because it irons on and pulls off easily) works best for making little patterns right on your ironing board, but really you can use any kind of paper. Straight edges are crucial, but a combo of your measuring tape and the edge of a book will work in a pinch. Something to write with: I use metallic gel pins for all my pattern making, but they don't photograph well. So, you'll see I used Sharpies and highlighters. You'll need some outer and some lining fabric. Think lush and chic and rich and precious! You won't need much (I'd guess 12"x24" squares of each would be more than ample.) and that means you can either raid your larger sized scraps or splurge on something new! 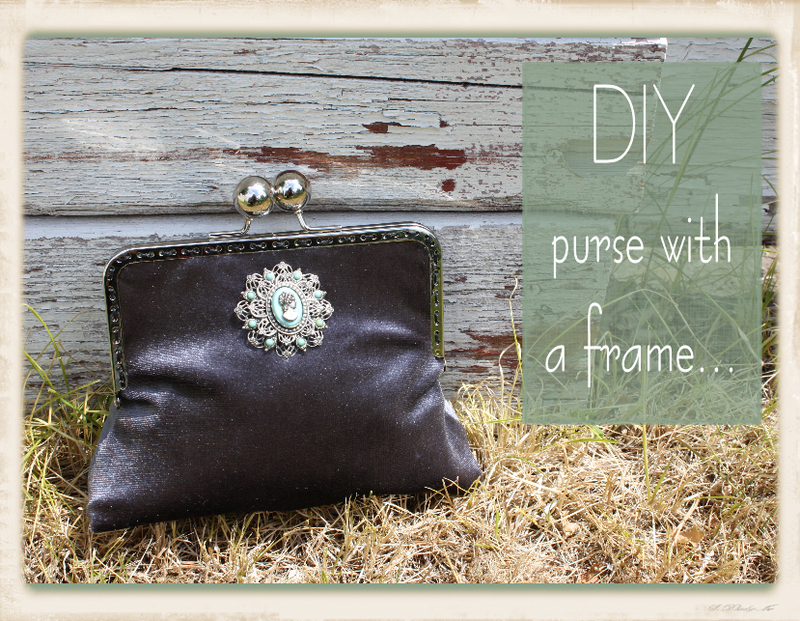 And let's not forget the purse frame! 1. Iron your big sheet of freezer paper right onto your ironing board. Unless you want an asymmetrical, wonky purse, you need to start with some precise(-ish) guidelines. The dotted lines in the picture up there are my guidelines. The lines are perpendicular (math-speak for they intersect creating 90 degree angles) to each other. One guideline is your center (the horizontal dotted line in the pic above). 2. Take your frame and center it on your center guideline and square it up with your perpendicular guideline. Trace the OUTSIDE edge of your frame. Note: I used a square-ish shaped frame, but a curvier one will work just as well. 3. The length of the pink line in the drawing is totally up to you. I chose 7" because I knew I wanted the height of my finished bag to be at least twice as tall as my purse frame. Essentially, it is the distance between the top of your purse frame to your bottom seam. YOU'RE the pattern-maker, so you decide. 4. You find the width of the base by doubling the width of the frame. My frame was 6"(shown 3"+3" in the pic above) wide so my base was 12"(shown 6"+6" in the pic above) wide. If you really want your purse to flare out at the bottom, add more inches. 5. Draw a straight line from your hinges to the edge of your base. If you used freezer paper, you simply iron on your pattern to the fabric you want to use. I usually just cut it out with the pattern still attached (no tracing!) or you can easily chalk around your pattern first and then cut it out. After you've cut out your pieces, make a little snip (less than .5") in each piece right where the hinge on the purse frame will be. Put your pieces right sides together and stitch around the edges, using your .5" seam allowance. Start and stop at the little snips you made, leaving the area where the purse frame will be unsewn. 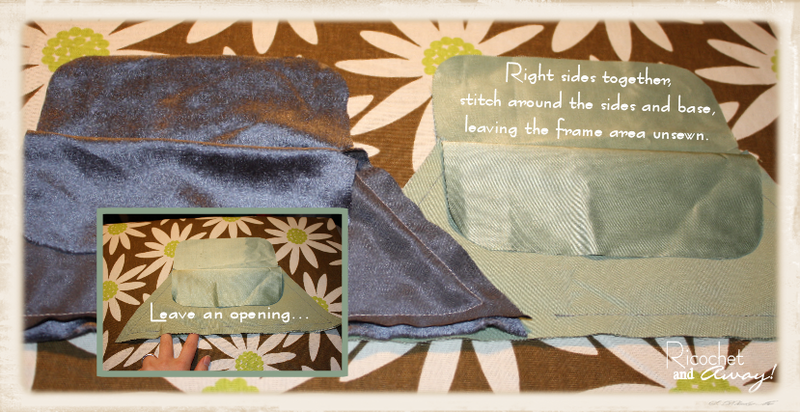 Leave an opening in the lining fabric as shown in the insert pic. Because stretch velvet is such a pain to work with (I tell myself every time that I'll never use it again...) I am showing this step using only pics of the lining. But you'll need to do this to BOTH the lining and the outer fabrics. First, press all the seams open. Next, match up the side seam to the base seam. 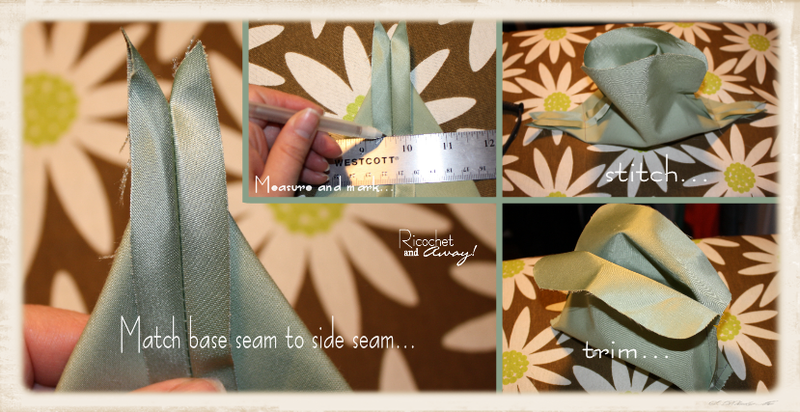 This is a little tricky, but be patient and try to match up those seams precisely. Once you have it, iron it down to help keep 'em lined up. Measure 2.5" down from the corner and draw/mark a straight line across. Stitch across that line and trim off the corners. You just gave your bag a flat bottom and sides! Note: the 2.5" measure is also optional. Increasing the distance will make do 3 things: 1) your purse will be shorter in height because the side seams will be shorter. 2) your purse will have a narrower bottom width because you are shortening the base seam. 3) your purse will have a bigger bottom depth because the line you marking and stitching will be wider. Turn your outer fabric so the right side is facing out, just like it would be in the finished bag. Keep your lining fabric like it is, with the right side in, just like it would be in the finished bag. 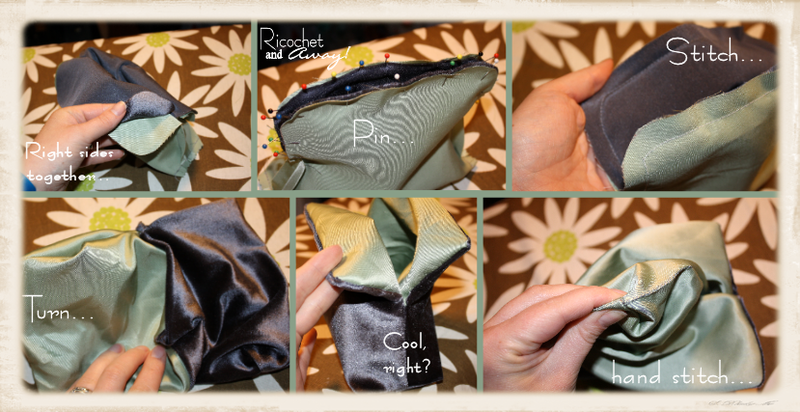 Put you outer fabric bag INSIDE your lining fabric bag so the RIGHT sides are facing each other. 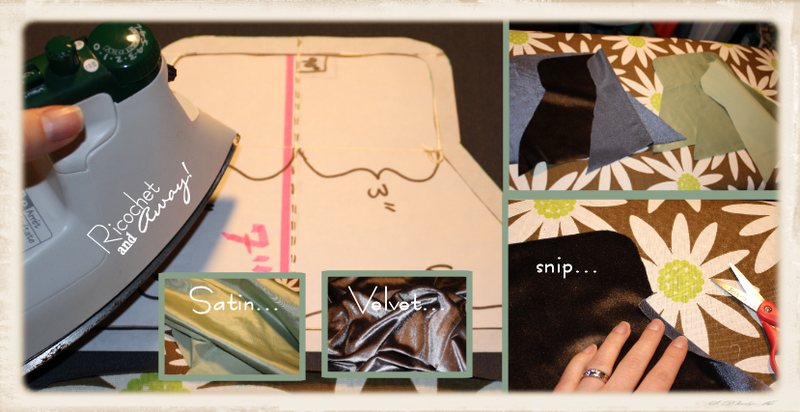 (These are the steps where I always got confused as a beginning sew-er so I tried to be specific in the instructions.) Match up all the corners and edges. Pin the edges and stitch 'em together using your .5" seam allowance. You should have some little holes where you initially made the tiny slits near where the hinges will go. Don't worry about sewing them up. You can use them to hide your knots when hand stitching the frame. Dig your fingers into the little hole you left in the lining and pull (or turn) out, essentially, everything. Now all your raw edges are hidden inside! It's like magic, right?! The last step is to hand stitch the hole in your lining. Now you get to attach the frame to the bag! The first thing I did was tuck the lining into the channel of the frame and tack it in there with some sloppy stitches in the corners and in the middle of the top edge. This held the bag in the right place so I could put in the 'real' stitches, and you'll take 'em out at the end. I used a double length of heavy duty thread, folded in half, and knotted at the end for my real stitching. Ultimately, that meant 4 threads being pulled through each stitch. Hindsight is 20/20, and I think embroidery floss would work even better. Important: Make sure you start with enough thread to stitch all the way around one side of the frame. That way your stitching starts and stops at the hinges and you can hide your knotted ends inside the tiny openings there. Look at the pics above to get a good idea of how I stitched it. After you've stitch all the way around both sides of the frame, come back with a seam ripper or tiny scissors and snip out the sloppy stitches. After you cut the threads, tweezers work really well to pull them out. Now you are seriously DONE! If you are bothered by the stitches showing on the lining inside, your can trim down some piping and glue it right over the stitches, tucking it under the frame. I didn't do it, but maybe you'll like the neater finish. Thanks for taking the time to read my long-winded tute! I honestly went back and shortened it up twice, but it is still purdy long. I think the seasoned seamstress can probably just look at the photos and know how to do it. But, I wrote this with beginners in mind. I always hated getting stuck on tutorials that had vague instructions, so I hope this helpful to someone. We are accepting entries up to March 31, 2012. You may still have time to enter! Click the button above to learn the rules and enter today! Thanks so much so checking out my blog. I surly hope you like it enough to become a follower. Hugs from Montana and happy crafting! Hi. I am a new follower. Love this project! 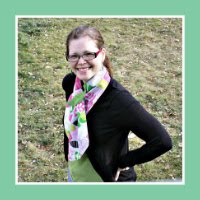 Stopping by to invite you to join Thrifty Thursday, because your I am loving your posts. Have a wonderful day. Blessings! OMG!! I love this tutorial. Finally someone who makes sense with the claspy thing. Thank you so much! Oh I am in love!! Thanks sooo much for the tutorial! Where did you get the frame? Awesome purse! I am so glad to see your tutorial; somebody gave me a purse frame ages ago and all I've done is stare at it and wonder 'but how do I use you?' Thanks to you, I now know! So I've been wanting to recreate my wallet which has two purse frames and I've been putting it off because I didnt know how exactly to put them on. Thank you soooo much! 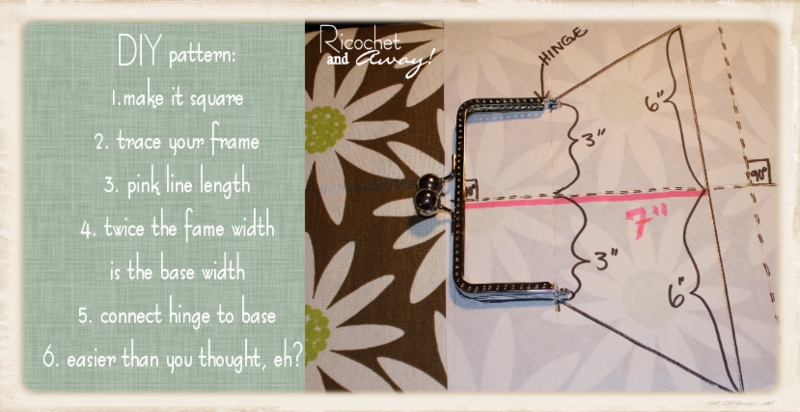 Great tutorial for drafting a pattern for a framed purse and also for how to stitch in the frame. For the only framed purse I've made, I used a pattern. I managed the frame OK, but I did find it fiddly. Next time I'll try your tip of adding a few sloppy stitches to hold it in place. Thanks for a great tutorial. Just before "After you've cut out your pieces, make a little snip (less than .5") in each piece right where the hinge on the purse frame will be." 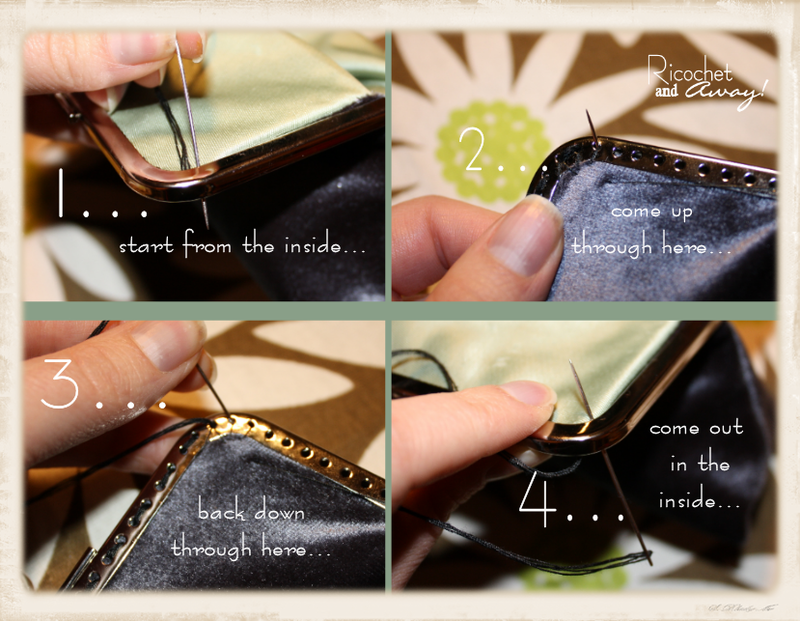 You should add "beginning 1/2" above where the hinge will be, stitch 1" so that it continues 1/2" below the hinge. This stay-stitching should be just a thread's width inside of the .5" seam allowance. Then make a little snip to stay-stitching. 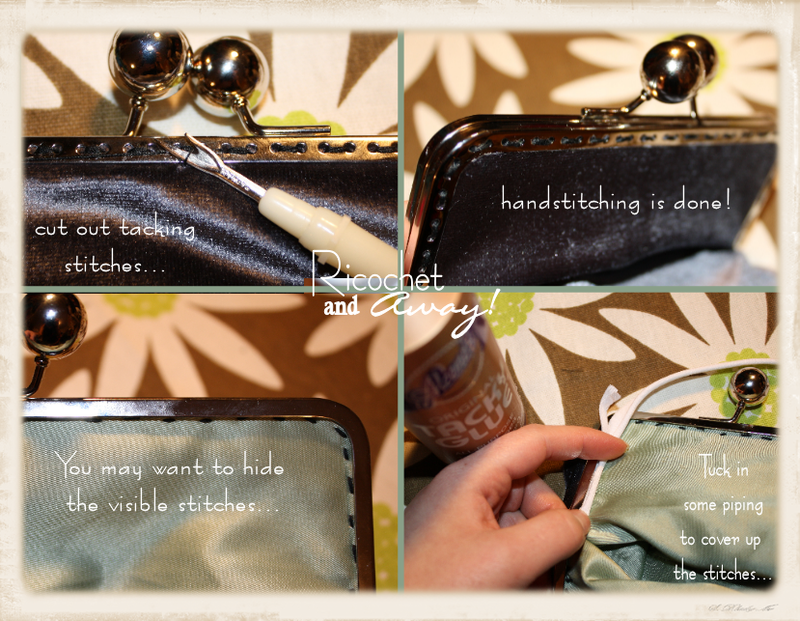 This will prevent the fabric from raveling once the purse is completed." 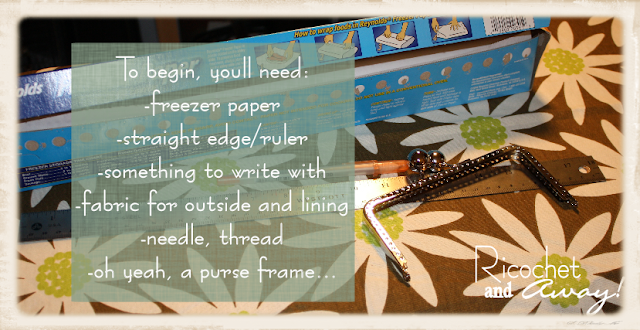 All the rest of the instructions are PERFECT for a beginning sew-er!!! Useful tutorial. Love this pattern. Gonna try this out. 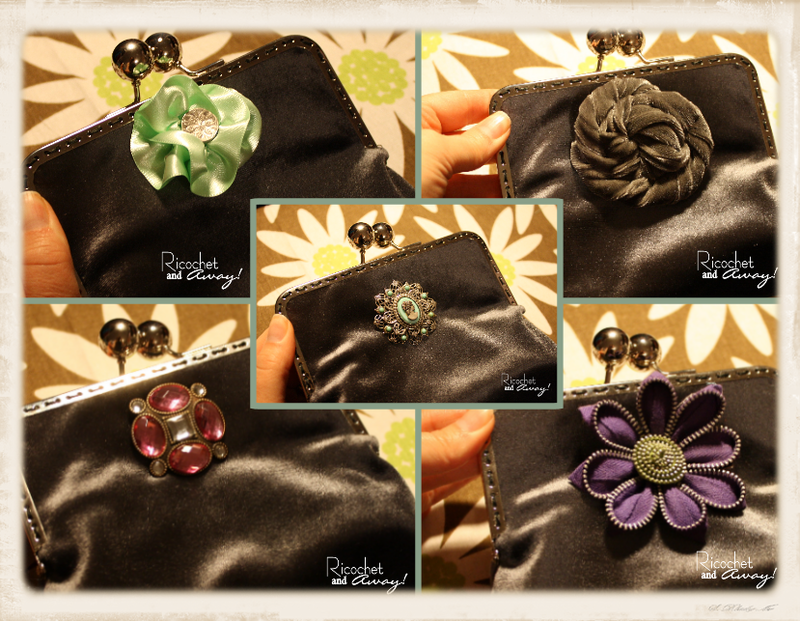 Thanks for sharing this purse making tutorial. Thanks so much for taking the time to leave a comment! No-reply commentors don't get to read my witty replies, and that's just sad. I'm a small town girl who loves to sew. I hope you'll accept one of my sewing challenges. Check out the challenge button on my menu bar. It's just for fun and everyone is welcome. Welder's Hat: I found a free pattern! I love to be featured! Just stay away from pics of my kids and be sure to include links back to the original posts. Also, this blog is for entertainment purposes only. Anything you take from here, you do so at your own risk.